In 1973, the Amsterdam-based feminist Marjan Sax received a considerable inheritance. For a while, she was not quite sure what to do with it. 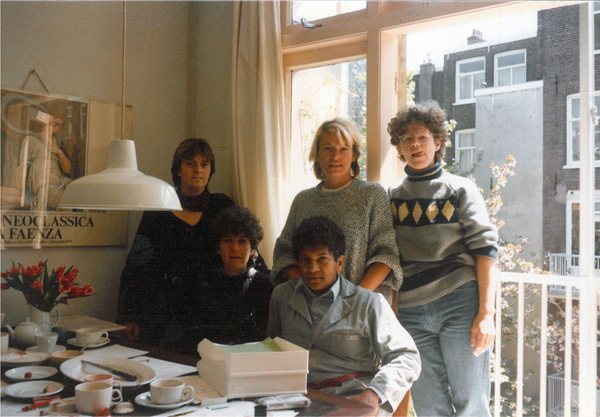 At that time, the women’s movement in the Netherlands had close connections with the left-wing movement, and both were anti-capitalist. Having considerable money at one’s disposal was seen as suspicious. Sax: ‘When entering a bank, first thing I’d do was check whether anybody had seen me’. A friend of Marjan Sax’s suggested that she might buy a building in which there could be a women-only residence. Sax liked the idea and entrusted the Marieke Ariëns Stichting with part of her inheritance for the purpose of buying two ‘women’s houses’. But 38 years later she admits that what she really wanted was for ‘the money to flow’. Together with four other lesbians from the women’s movement, she came up with a plan. The first two to join Sax were Dorelies Kraakman and Patti Slegers. Later on Lida van den Broek and Tania Leon joined the group. The plan came together in 1982, but the actual statutory registration of the Mama Cash Foundation, as ‘a private fund for women’s projects,’ took place in 1983. Mieke van Kasbergen, who at the time worked as a taxi driver in Amsterdam, came up with the name ‘Mama Cash’. The name was inspired by Cass Elliot, also known as Mama Cass, a singer with the vocal group The Mamas and the Papas. Sax gave Mama Cash a loan of 2.5 million guilders (1,135,000 euros), and the interest funded the organisation. The money was invested in bonds and stocks. During those first years, these investments yielded about 200,000 guilders (91,000 euros) a year. They agreed to keep it a secret that Sax had provided the start-up funding. This way Sax could say without hesitation that ‘some woman gave a substantial loan to set up Mama Cash’. When she met Tracy Gary in the USA, who had united wealthy women for Resourceful Women, Sax was inspired to come out as a woman with resources. She did so in an interview with the weekly ‘Vrij Nederland’ in 1989. Sax: ‘The number of responses was overwhelming, but most were positive. An important factor was, of course, that I hadn’t kept the money for my personal use, but that I had dedicated it to Mama Cash. From that moment on, there was no more need for lies or excuses. It was an incredible relief’.